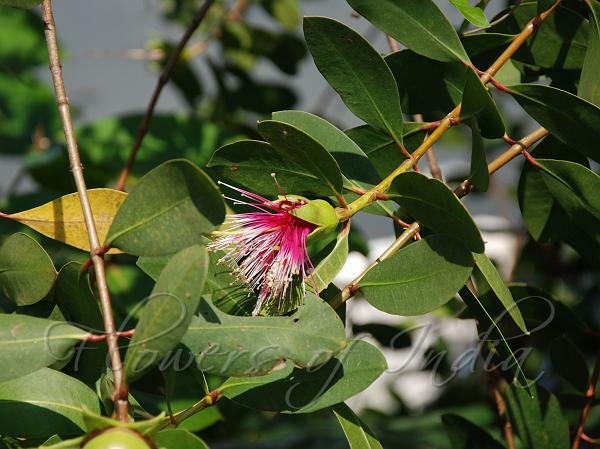 Apple mangrove is a small evergree tree, upto 8 m tall. Branches are horizontal, twig slender. Leaves are about 7 cm long, rounded and opposite each other on the branches. The tips of the leaves are slightly turned under. Sonneratia alba has white flowers while Sonneratia caseolaris has red flowers. Sepal tube is green with 6 valvular lobes. There are 6 red petals, which are overshadowed by long showy, numerous stamens, which are white, but reddish at the base. Flowers only open for one night and have an offensive smell. The fruit is large, about 4 cm across, green, leathery berries with a star-shaped base. When ripe, the fruits are eaten raw or cooked. 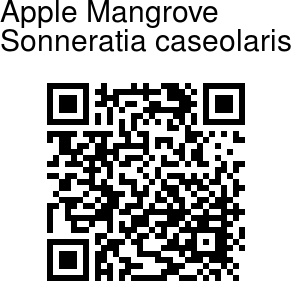 Apple Mangrove is found in Indo-Malesia and Australia. In India it is found in Western Ghats. Identification credit: Asokan Mash Photographed in Kollam,Kerala.